The Hotel Milano is located in downtown Sanremo, a five minute walk from the famous Teatro Ariston (Ariston Theatre), from the bathing establishments of Sanremo and a minute from the Palafiori, the modern congress centre of corso Garibaldi, home of international events such as Festival di Sanremo (the Festival of Sanremo) (the Italian song festival) Sanremo in fiore (Sanremo in bloom), the annual event whereby florists from all over Europe display extraordinary floral compositions. 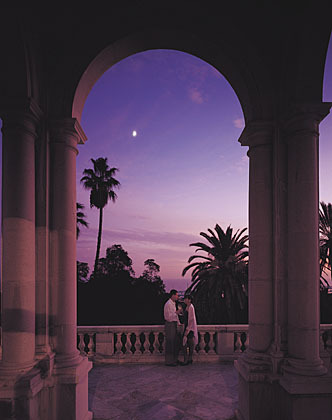 Those who choose to stay at the Hotel Milano, also chooses one of the historic dwellings of Sanremo, charming Art Nouveau, once home to the Shah of Persia. 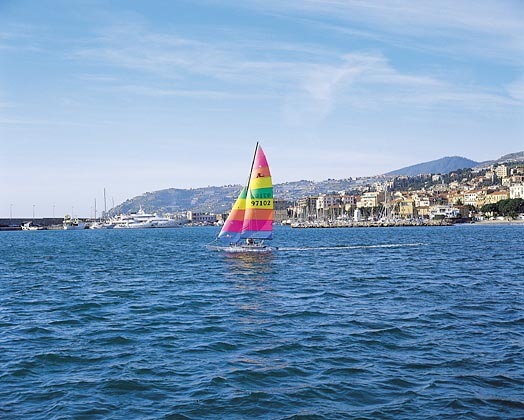 Capital of the Riviera dei Fiori (Riviera of Flowers), Sanremo has always been known for its pleasant climate so much that during the end of the Nineteenth century and beginning of the Twentieth century the aristocrats from all over Europe elected it as a vacation spot. Corso degli Inglesi, is the greatest of expressions, 500 metres from Hotel Milano, it is a succession of noble Art-Nouveau houses facing lush gardens, such as Castello Devachan (Devachan Castle), Villa Bel Respiro and Villa Vista Lieta. A must see is also Villa Nobel, where the famous Swedish scientist once lived, and Villa Ormod, with the beautiful botanical garden, both in corso Cavallotti about 800 metres from the hotel. If you wish for a 3 star hotel in downtown Sanremo, in order to visit the Riviera dei Fiori (Riviera of Flowers) and the Ligurian Riviera, and to climb the Pigna, the characteristic age-old village with carrugi (little streets) and steps much loved by Italo Calvino, the great writer that spent his youth in Sanremo, the Hotel Milano is amongst the most pleasant due to its location, atmosphere and comfort. Also for lovers of shopping, the corso Matteotti with its boutiques and fashion and jewellery show rooms is only a 3 minute walk from Hotel Milano. The airport of Nice in France is the closest airport to the Hotel Milano at Sanremo, only 65 km from the hotel. From the air terminal take the bus for Genoa and get off at Sanremo (requested stop) or take the train for Ventimiglia, therefore get off at Sanremo. The Hotel Milano is about 300 metres from the train station (refer to the item By train). 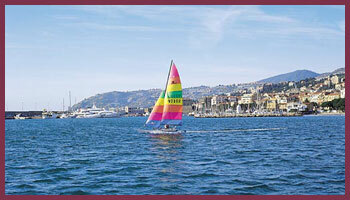 The airport of Genoa is the closest Italian airport to Sanremo, to Hotel Milano, at 135 Km from the hotel. From the air terminal take the shuttle Volabus for the train station Stazione Porta Principe of Genoa and continue by train for Sanremo (Genoa-Ventimiglia line). The Hotel Milano is about 300 metres from the train station (refer to the item By train). From all directions arrive at Genoa’s train station Porta Principe and continue by train for Sanremo (Genoa – Ventimiglia line). TheHotel Milano is about 300 metres from the train station, you can reach the hotel with a 7/8 minute walk: take corso Cavallotti, then corso Garibaldi and the hotel is located at number 39. Or take the bus “Sanremo centro” or “Villa Helios” and get off at the first stop. The Hotel Milano is at 52 metres. From all locations you arrive at theAutostrada dei Fiori A10 (Genoa – Ventimiglia) and continue towards Ventimiglia. Get off at Arma di Taggia, continue towards Sanremo on the Aurelia Bis and get off at Sanremo / San Martino. 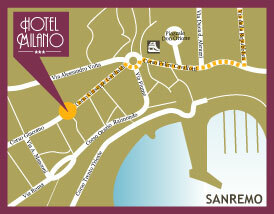 Take the via della Repubblica to reach downtown Sanremo. Continue going straight on corso Cavallotti then on corso Garibaldi. You have arrived: the Hotel Milano is at number 39, park in the hotel’s private parking.